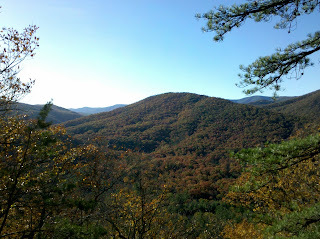 Narrowback has amazing views out into the larger watersheds to the west! Virginia's George Washington National Forest is amazing. Black powder season is a few days off. Stokesville is a golden glow! Looking for the perfect trail alignment to Narrowback south! 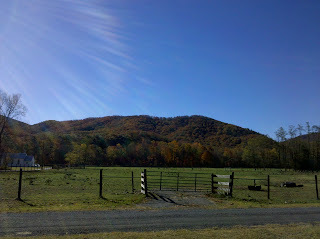 Lynn Trail is the 2nd climb in the Shenandoah Mountain 100 bicycle route. It is one heck of a challenging trail to climb. The Shenandoah Valley Bicycle Coalition just reconstructed the rocky steep and very difficult to ride switchback about half way up the trail. Thanks to Ed Sutton of Trail Dynamics for coming out and volunteering with our local bicycle club. Trail Dynamics just finish the work on lower Wolf Ridge Trail which is the descent that bicycles use after the climb on Lynn Trail in the Shenandoah Mountain 100. The Wolf Ridge trail project was funded by a Recreational Trails Program (RTP) grant that the Shenandoah Valley Bicycle Coalition was awarded. The grant is administered through Virginia's Department of Conservation and Recreation and funded by the Federal Highway Administration (FHWA). The funds are from the estimated tax from fuel that is not used on our highways. Another beautiful day of backcountry bike packing along the Great Eastern Trail. Most of the proposed Great Eastern Trail is shared use and open to bicycles in the George Washington National Forest. Where the trail alignment goes towards single use trails like the AT in Southern Virginia and parts of West Virginia the bicycle route will takes its own direction towards Damascus, Virginia. This bicycle route will be taking the name Virginia Mountain Bike Trail to represent the route best for bicyclists in Virginia. We rode our bicycles so very far into the wild lands of West Virginia in Seneca Creek this weekend. Autumn at its finest. Huckleberry Trail, Lumberjack, High Meadows, a swim in Seneca Creek, Horton, Allegheny Mtn. to Whites Run. What an adventure! Thank you Monongahela National Forest for maintaining these fine trails. The brush job on Allegheny Mtn. Trail down to Whites Run was stupendous! Dan Fudala enjoying the solitude as he rides his bicycle deep into the wilderness along North Fork Mountain Trail in the Monongahela National Forest. hurts everyone access to this amazing wild place.